Within every workplace, there are taboo topics. I’m not talking about politically incorrect topics. And I’m not talking about legitimate wrongdoings. I’m talking about the ways you and the people on your team behave every single day. The inefficiencies that stem from revisiting decisions, and the workarounds that have been developed to get things done. All because of the elephant in the room. The problem named is the problem solved. Let’s face it: elephants aren’t meant for the office. They’re big and loud and make the place smell. None of us likes their presence, yet we live with them pretty regularly. So how can we become more adept at addressing them? Whether we think we have the skills to do so or not isn’t really the issue; this is something we don’t practice enough to have confidence about it. There are many reasons people choose not to talk about the elephant. At some point, though, the pain of not addressing it surpasses the pain of living with it. Clarity – do you really know what the issue is? We often mask the real issue through the lens of what we usually talk about (e.g., resources, time, money, competitors, profits). Get clear on root cause, being careful of making too many assumptions. Conviction – for the sake of what are you committed to moving through this? Having a goal and knowing what’s on the other side of dealing with this helps you and others move through it. Care – how can you be compassionate regarding the tough emotions that might come up? The first sign you give that emotions aren’t ok is the last time people are willing to remove elephants with you. It’s imperative that you acknowledge people’s responses and allow for reactions to be aired. Think back now to your answer you mentally gave when I asked what the undiscussables are at your organization. When you are ready to address it, which of the 5 C’s will you struggle with the most? Isolating the variables is the first step to preparing yourself and being successful when raising these conversations. 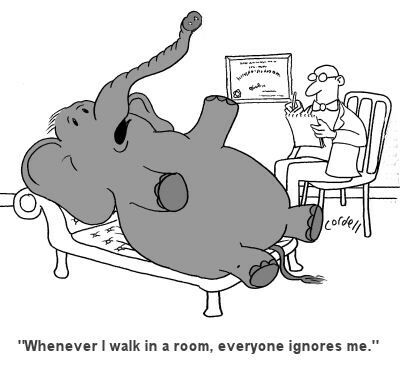 Certainly, there are many reasons people chose not to address the elephants; it won’t be for everyone. Acknowledging these hidden issues, however, is a crucial part of leadership.